Blowout Sale! Save 65% on the I Focus 2 in 1 Wireless Numeric Keypad with Calculator Function, USB Financial Accounting Numpad Solar Power 29 keys Number Pad for Laptop Desktop PC Windows XP by I Focus at Pacs BG. MPN: 43235-168807. Hurry! Limited time offer. Offer valid only while supplies last. 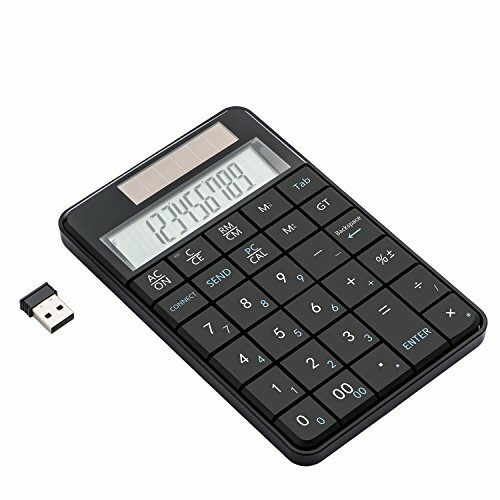 Product Features: ◆Calculator: The wireless usb numeric keypad can use a calculator or the keyboard mode. The switch (PC/CAL) between them. ◆Calculator: The wireless usb numeric keypad can use a calculator or the keyboard mode. The switch (PC/CAL) between them. ◆Connect: When calculator and computer connection, install batteries, you can click "connect" button to connect to the computer, and then you can press the "send" key calculation results will be sent to the computer. ◆System requirements: Windows XP or Vista / 7/8/10. ◆note: Mac OS X is not compatible with the keyboard. Receiver: USB Receiver,25 feet from the computer. Solar Panel,no need batteries while use it as a calculator. The wireless usb numeric keypad can use a calculator or the keyboard mode The switch (PC/CAL) between them. When calculator and computer connection, install batteries, you can click "connect" button to connect to the computer, and then you can press the "send" key calculation results will be sent to the computer. Compact, convenient wireless keyboard backspace Big, full size, soft concave button to improve efficiency. Plug and play. Keyboard digital display is clear, effective distance of 10 meters and 2.4 g frequency operation. 29 key design, the key is suitable for the size of the office. If you have any questions about this product by I Focus, contact us by completing and submitting the form below. If you are looking for a specif part number, please include it with your message.